A deflated giant soup dumpling after the soup was sucked out of it. At Nan Xiang Xiolong Mantou. Drunken Dumpling has been getting a lot of positive press since it opened a several weeks ago, particularly for its giant soup dumpling (see the NY Times piece). I had my first giant soup dumpling about 5 years ago at Nan Xiang Xiolong Mantou in Shanghai. After I had eaten there, my Shanghainese colleagues told me that giant soup dumplings were a PR ploy to bring in tourists to the restaurant and no self-respecting resident of Shanghai would eat a giant soup dumpling. I’ve gone to Drunken Dumpling twice and have not been able to get in because of the crowds. The first time I showed up with my dumpling eating posse, but Drunken Dumpling is really too small to accommodate four large guys hoping to eat piles of dumplings. The tables are small and can fit one steamer or a tower of several steamers, and really can only handle parties of two. The second time I went alone, but on a Thursday night and the line was down the block. I had concert tickets and couldn’t wait out the line. Now that I know the score, I will go back on a weekday afternoon and try and finally eat some of their dumplings. 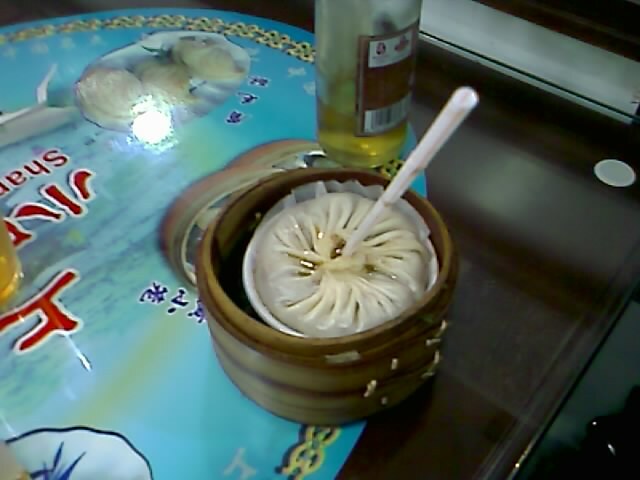 This entry was posted in New York City, Soup Dumpling. Bookmark the permalink.